After the Jug Was Broken: "The Good, the Bad, and the Ugly"
Why is it I can find good, healthy food anywhere in the world that we’ve traveled to except my own country? 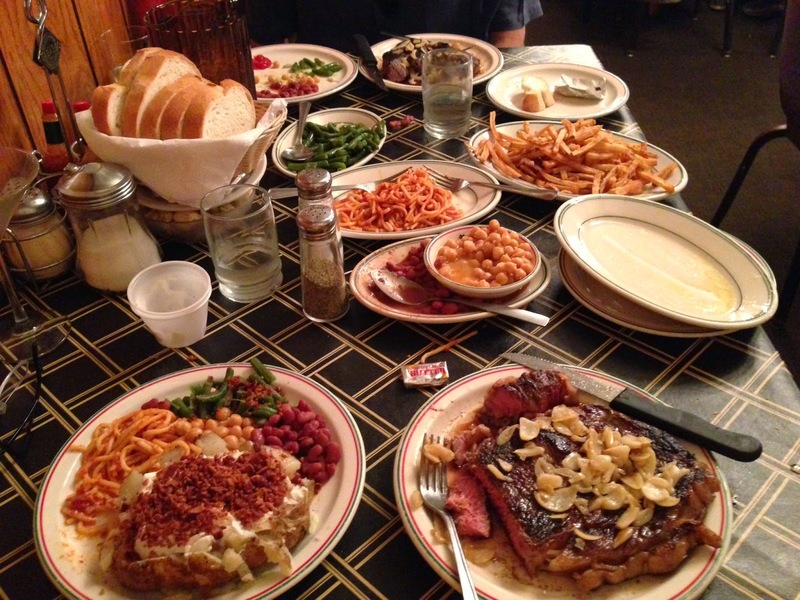 In a restaurant in Nevada, Bill is handed a plate with 21 ozs of steak, and 4 side dishes - french fries, baked beans, cole slaw and spaghetti, plus a half loaf of bread with an ice cream scoop of butter, not to mention cabbage soup before and the possibility of a sundae with churros - fried donuts - after. We see obese children, obese adults everywhere. I feel such sorrow for them. But two hamburgers, fries and a soft drink cost $13. An organic, beautifully plated restaurant dinner can be more than double that - for one. There are huge, pornographic signs of juicy burgers along every highway to tempt the hungry, just as in the Bay Area there are billboards of sinfully thin cell phones in suggestive colors. We’re crossing the mountains. My turn, and I drive Highway 82 over Independence Pass. The vistas are stunning, and then it is raining, pouring, and I take hairpin turns at 10 MPH and the temperature is dropping - down to 53, 47, 37, and rain turns to sleet. There is nowhere to pull over and wait it out. The driver in front of me must fear heights because he is driving down the middle of the yellow line - if another car comes the other way?! I began the morning in sandals and when we can finally stop I jumble through my suitcase for shoes and socks, and we drive through the mountains to our rented house, where we hope for quiet and solitude. Snow on the side of the road, full moon and the shadow of pines on bright meadows. (Yes, Divide), where there are also coyotes and a colony of foxes. The rest of our tour group walks on, but one wolf stays by the fence and I remain, staying silent and still. The depth of those eyes! Their faces are so expressive, how could anyone imagine they don't feel? Three thousand wolves have been shot in the last few years, since they have been delisted. Extermination? In sci fi action films humans are always in danger from some alien force that wants to do away with us. We pay to see the unconscious revenge for our own murderousness. The view from our rented house is of red boulders massed into mountains, and in contrast to that massive stillness, there are the clusters of quaking aspens that the cottage is nestled into. A trembling ballet - each leaf loose on its petiole, moving in its own arc in the slightest breeze. I watch the leaves. To exist on pure sunlight is the genius of plants. Everywhere we go, people are so friendly, chatty, helpful. We have forgotten that Americans have these qualities, since they are rarely experienced in urban California. I have traveled from a high tech center where raw materials are converted into wealth, to the place where the materials come from. 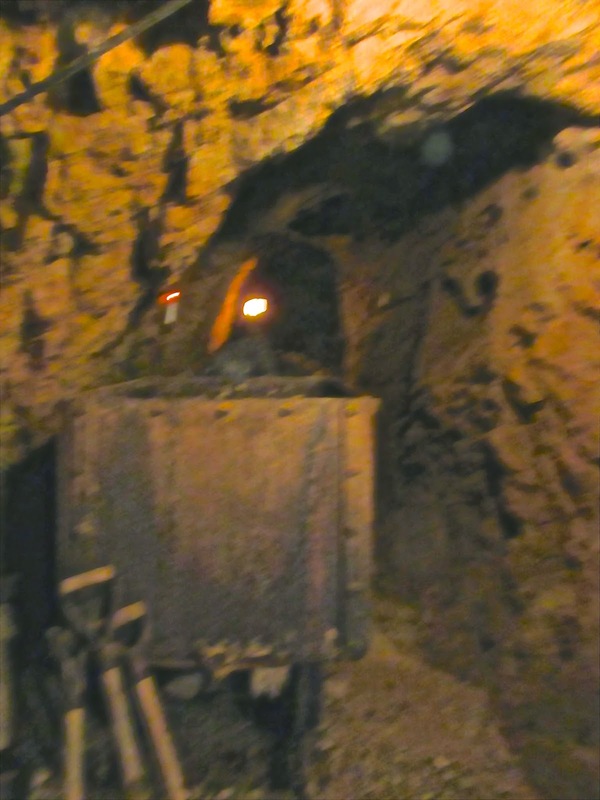 We visit a restored 19th century gold mine in Cripple Creek, riding the cable-driven cage down 1000 feet. We are there because I wanted to know what it felt like to be a miner, working by candlelight below ground, desperate to not use up the 3 candles he was given. We learn how it began in the 1850s when a miner only had had a steel mallet and a spike. Along came the drills that deafened the men and sent dust into their lungs. The mine owners knew there would be 1 oz of gold per ton, and the drills got faster, more powerful, and heavier - and heavier. One man had to take the drilled and blasted rock and load it into a metal cart on rails - load a ton in twenty minutes or get fired. There were actually many jobs in the early West - carters, millworkers, haulers, carpenters, blacksmiths, ranch hands and drovers - but mining paid $3 a day while the going wage was 75 cents. The metal carts were once pulled by burros who never left the mine. They were tethered and fed in packed underground stalls until they were replaced by engines. Feral donkeys, their descendants, now roam the mountains. What seems to drive technology is not human need but the bright and new and shiny and machines of war. gentle, like before the other Jaspers came. On our way to a wilderness hike, we drive though miles of burnt forest. 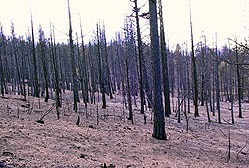 Could this be the stillblack remains of the 2002 Hayman fire, which destroyed 138, 000 acres? It is. We drive forest roads though unforested rock littered with burnt branches, till we see the sign for Lost Creek Wilderness, then the land is green and treefull again. We walk into the forest, listening to the birds and the creek. How did the wilderness escape the fire, we wonder, only to find out that if we had taken a different road we would have seen the burn of wilderness as well as national forest. A man-made fire 12 years ago, and there is no sign of renewal. Nothing has grown back. No new post-fire species have appeared. Watching the women walk into the restaurant, I imagine myself in high heel boots, rhinestone studded jeans and black leather jacket. Who do I know in San Francisco whose shirts are as perfectly pressed as the men here wear with jeans and a Stetson? And then there are the teens in cap and gown having a proud supper with family- here where underemployment is daily life - and will they have it any better? Was it engine-uity blasting through the rocks of Capitol Reef creating a slit large enough for the 26 wheelers to pass through? The trucks look dwarfed and the last sign said Goblin Valley. We are looking at strata laid down before the Permian extinction, 250 million years ago. We’re following a giant mining truck, hauled around the curves on a tractor trailer. Then another one. There are open pit gold mines all over Nevada. But oh those spaces - the vast, rolling, peaked and pine-studded West. Can we save them from ourselves so the next generations can experience what we have? A very painful (and beautiful!) account. Thank you!